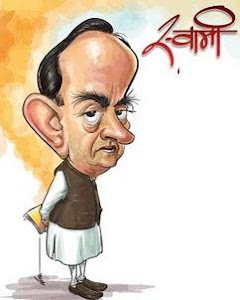 Know your Swamy: Swamy defines a Virat Hindu! Swamy defines a Virat Hindu! Swami ji I read in wikipedia that first Bharat Ranta was C Rajagopalachari, Sarvepalli Radhakrishnan and C. V. Raman on 1954, The Nehru got it next year. Is this a fact. One big problem of Indian politics today ! Dr.APJ Abdul Kalam's book nails Swamy's lie! They (babus) got credit for my blueprints! He ( P Chidambaram) is wrongly taking credit! Islam's impact on Indian society! He (sangma) will win presidential poll ! Bali Sugrive syndrome as applied to him (Jagan)! He (N K Singh) is Nitish's Shakuni! Team Anna and Naxalites are anti-national!